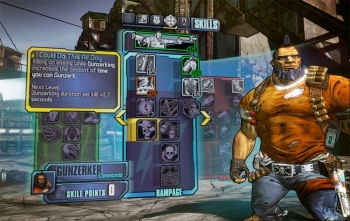 You don't need to wait for a Game of the Year Edition to get the Borderlands 2 expansions. The original Borderlands had a lot in its favor, including fun action-oriented gameplay, flexible drop-in drop-out co-op support, and a seamless blend of FPS and RPG elements. On the whole however, one of the biggest contributions to its success was the huge amount of DLC support provided by Gearbox, which allowed the massive Game of the Year Edition to continue to attract new fans well after the game's initial release. 2K Games and Gearbox are well aware of how popular Borderlands DLC can be, so they'll be offering a special deal when Borderlands 2 launches next month: a $29.99 Season Pass that acts as a pre-order for all of the title's upcoming DLC. The pass will include four unannounced DLC expansions that will receive staggered releases after launch, with the final pack planned for June 2013. Individually, each DLC set would cost $9.99, so you'll save about ten bucks getting the whole set at once. We can also expect 2K and Gearbox to reveal a Game of the Year Edition sometime after June, but given the popularity of the Borderlands franchise, I expect that many fans will not be willing to wait that long to get involved. The Season Pass will be made available once Borderlands 2 launches, and can be purchased through the PlayStation Network, XBox Live, and Steam for the price mentioned above or for 2400 MS points. Sadly, the pass will not be included in any of the current Borderlands 2 collector's editions, but considering the inordinate amount of swag those already contain, you'll be getting your money's worth either way. Borderlands 2 and the Season Pass will be available on September 18th, 2012.